I finally tackled my fear of egg whites- learning to separate them, whipping them to desired consistencies etc- and am very proud. After making the creme brulee I had some egg whites maturing in the refrigerator and I had no clue what to do with them. Well I sort of had a clue, but since my confidence levels were not up to mark, googled for hours deciding what to do with the egg whites. Nothing interesting came out of the search and so I finally gave into the macaron frenzy that almost every food blogger is now aware of. I was very very sceptical as to how it would turn out and Shab and Finla totally helped me out with the entire thing. To be honest it was Shabs continuous FB status updates about her awesome mac flavours and finding feet that made me even consider making macs (at some point in my blog life), but it happened sooner than I thought. I know I'm making it sound like an achievement, and trust me it is, when you see the feet (which you obviously know what it is) you feel joy (melo drama to the core, but please humour me). I would have been devastated if my macs hadn't come out decent, because for 1 it is not an easy job, 2, the quantity of ingredients used is not less and 3, its bloody messy. So after all this if my macs hadn't come out well, I would have cried, seriously, I would have screamed and cried and maybe even pulled my hair out. I went through the mac bible (as I would like to call it) like a girl studying for the exams, that if someone questioned me what the first line on page 3 was I would say it, even in my sleep. I don't think I have ever been this determined to make something right. I was warned that I would be addicted to making macs again and again and in different flavours, once I got the hang oft it...but I must say, I'm done with the whole mac thing. Its too much of work and I care way too much about feet that I cant handle that pressure again :). But like I have previously mentioned, every food blogger should have tried making a red velvet cake, baked bread and made macarons at least once in their blog life. Now that the macaron bit is out of the way, I have all the time to experiment with bread (I do bake bread, but it's still not perfect) and the red velvet cake (this doesn't count as I made it with a mix). 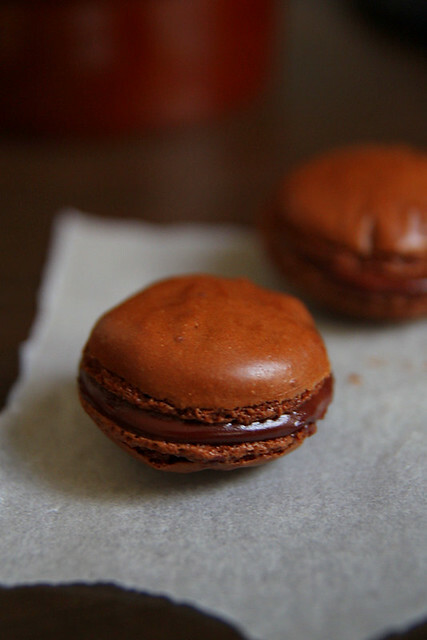 Word of advice to those trying to make macarons for the first time, read the mac bible mentioned above and Meeta's notes on the same and you should be good to go. If you don't find feet, that's fine too. Just sandwich them anyway and give it to your husband saying its this awesome new dessert that you came up with. Mine would believe it in a second and so I wasn't too concerned about the "omg who will eat these feetless things' part of it. Pics are not that great cos after I was done with the whole episode, it was about 3pm and there was very little light. I was also in no mood to make it presentable, and hence the gloomy pics. Get the baking tray with baking paper ready. You would ideally need two trays for this quantity. In a food processor or grinder pulse the icing sugar, ground almonds, espresso powder and cocoa powder till nice and powdery. Then sift the mix a couple of times and make sure there are no lumps. The mix may still be not fine as icing sugar, but it should not have any larger chunks or lumps whatsoever. Using a free standing mixer with whisk attachment or a hand mixer, whisk the egg whites till frothy. Into the almond-sugar mix add the meringue and fold it in using a spatula by starting from the bottom and continuing to the top (again refer the bible), till you get a smooth even mixture. The batter should fall back in ribbons when you lift the spatula. Also put a spoonful on a plate and if it spreads out on its own, then you are good to go. If it doesn't, then give a couple more folds and it should be fine. Place the batter into a piping bag with a plain tip, and pipe away, leaving about 2 inches gap between the shells. Leave aside to dry for half an hour. Once done, cool on a rack completely before doing the filling. For the filling, bring the cream to a gentle boil and pour over the chopped chocolate. Keep aside for a few minutes. Once the entire chocolate has melted, stir gently to mix it all in and get a smooth and silky texture. Notes: The espresso powder I used was really strong, so the coffee flavours were a tad too prevalent. If not a coffee fan, then you might as well replace with instant coffee powder. 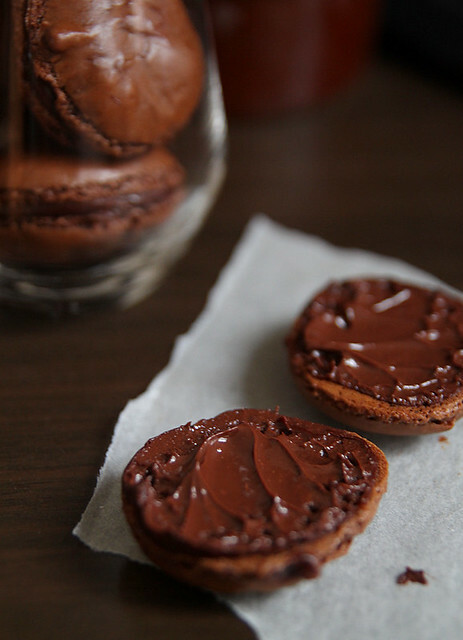 The macarons are immensely sweet, so the dark chocolate ganache paired fairly well with the sweetness. Perfect balance, if you ask me. The almond powder is a pain in the a**. The ones we get here are coarse and so I had to sieve it a couple of times, then pulse it with the other mentioned ingredients and then sieve again a couple of times to get a somewhat fine consistency. Use egg whites matured in the refrigerator for 2 to 3 days for best results. I brought them to room temperature before using though. If you have a template it makes matters easy, but as usual the last minute madness made me forget all about it and so i just randomly piped them on to the paper. Congratzzzz .... I know a very few people who get this right the first time. I am yet to experiment and overcome the fear of mac .... and the last line of caution about patience is a bit intimidating. The macs look gorgeous ! awesome post Nisha. a perfect start to the year. they looks absolutely stunning. 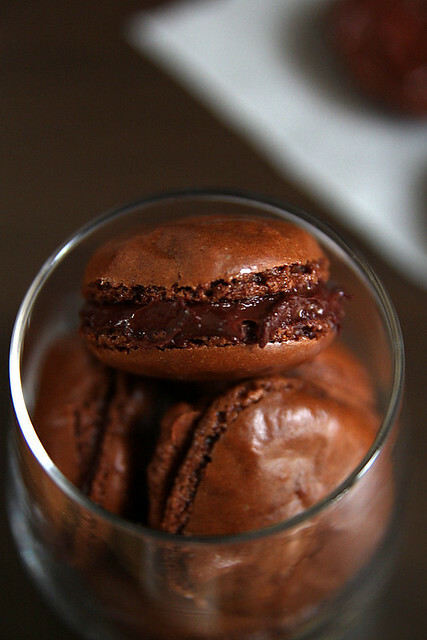 Perfectly made..:)) Looks beautiful and very tempting..
Congragulations on making macarons, and they look yumm. Yeah isn't it great you got over the fear of making them, once you have made them i am sure you will make them again. Yummy looking chocolate granache. Wonderful recipe. I have been a bit sckeptical abt trying macroons... Always felt its difficult.. I need to try it out..
very cute and beautiful !! very tempting !! YUM...I love cookies with chocolate in the middle. Wow cute looking marvellous macarons, well done Nisha. Great job on making these macarons! I am still planning and planning .. just not able to ! like they say whtev happens happens for the good: your 3 pm shots have come out absolutely dark and moody and "the oooo wow" kind. seriously. 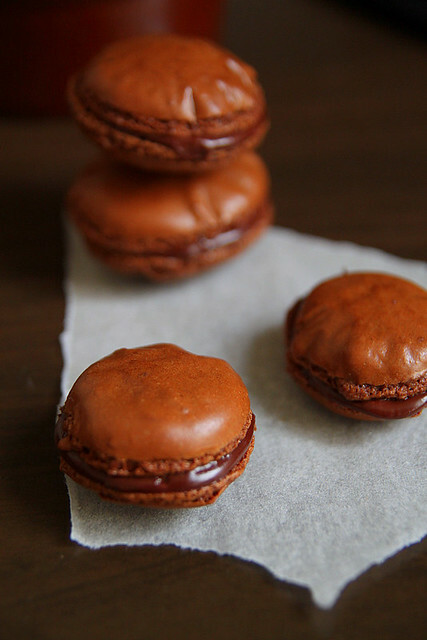 i think it wont be ne time before Alice turns 4 i'll even think of trying out macarons. kudos for the effort and the results! Lovely photography! And macaroons looking great and delicious! great effort! Well done - and this is a great achievement so you have all the right to do the happy "feet" dance. 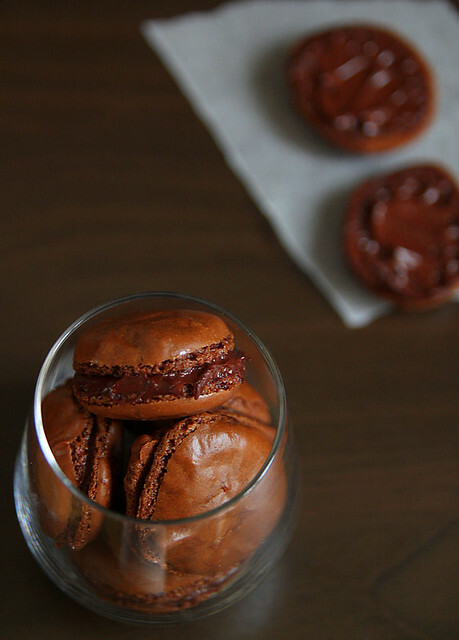 Lovely dark tones to the macarons! Thanks for mentioning my Macaron Notes and glad they were helpful! Congrats on getting it right, I have failed probably two times, may be I should give it a go again. oh wow!!! sounds and looks amazing!!! Hey Nish! am going to attempt my first real mighty mac. so doing all the ground work now (and going to keep my egg whites to age, seeing as i am in humid chennai, i may need to leave it to age at least 5 days-what say?). will ping you if anything, is that cool? Instead of adding the merengue into the powders, it's supposed to be the powders folded into the merengue gradually. That is the "correct" french method. Also, to remove bubbles, before letting it rest, tap it on the table a few times. Oh, and most of the time when done assembling, they are frozen like about 2 days or so, and then taken out 2 hours before eating. I guess that part can be optional. Expresso with ganache chocolate is such a great marriage and you have such superb food prose and photography! 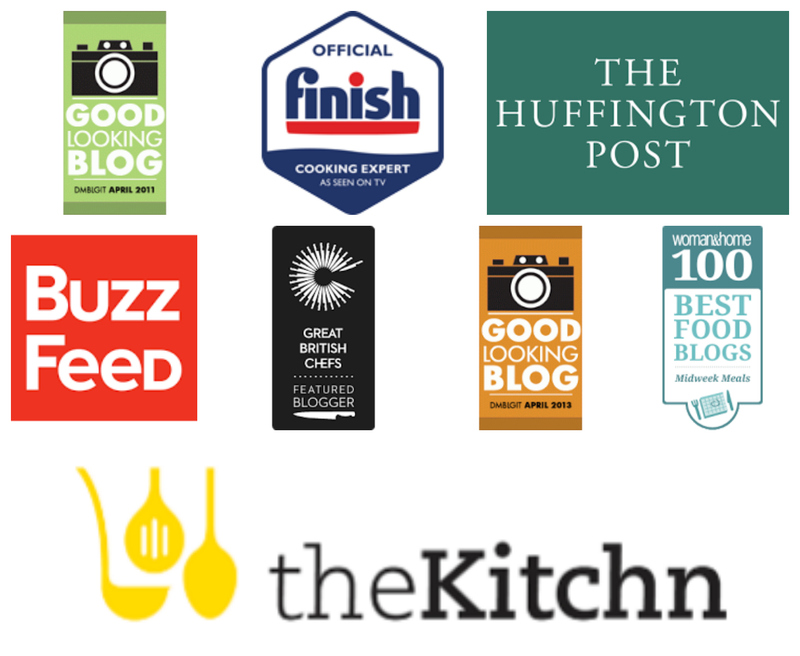 I am the Community Manager over at Gourmandize UK & Ireland and I think your macaron recipe is excellent, so much so that I would recommend that you take a look at our Macaron Master Challenge currently on for another week.. Your pictures make me want to give this a try.